Are you tired of not knowing if you’re training enough, or too much? Does it feel like you’re constantly getting injured or falling ill as soon as you start making progress? Do the countless “gurus”, both off and online, have you so confused that you don’t know whether you should be resting or doing threshold intervals? Imagine a place where you can get access to a group of MTB coaches, who not only understand you and your cycling goals but are able to help you perform better than you ever have while avoiding injury & illness. Throw in a supportive community of mountain bikers just like you who are there to cheer you on and keep you on track with your goals. If you’re tired of 'winging it' and want access to proven training programmes (backed by scientific principles), with a coach by your side and a group of MTB'ers just like you that will not only hold you accountable to your goals but will celebrate your successes, then this is for you! The Coach Parry Online Training Platform is an interactive, web and app-based platform that will guide you and give you everything you need to become the best cyclist you can be. With over 50 training programmes in the library (Including cycling, triathlon and running programmes) we've got you covered. PLUS we're continuously adding new programmes so you'll never run out of training plans to follow. Whether you're training for your first or fastest cross-country race, just starting out, training for a 50km XCO or a multi-day stage race, our programmes will help you achieve your goal. Aside from training advice, you'll also get access to a bunch of cyclists, just like you who are on a mission to become the best they can be. 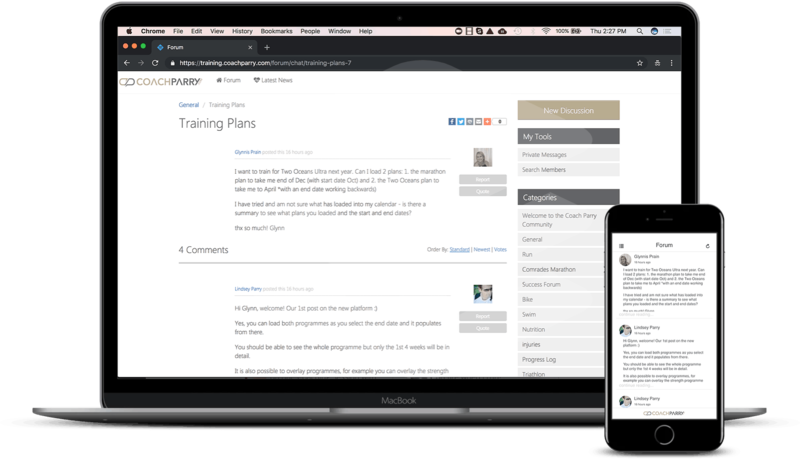 If you’re looking to stay motivated or for an accountability buddy, then the Coach Parry Forums are the place to go. If you want structured training programmes that will help you achieve your cycling goals, that will tell you exactly when you should train, what you should be doing and for how long. If you want to be able to chat with the Coach Parry Coaches when you need help or if you want advice on which races to do, what pace you should ride them at and what gear you should or shouldn’t use. If you want motivation and accountability, a community that won't judge you but rather encourage you to chase your cycling goals. If you want structured training programmes that will help you achieve your cycling goals, that will tell you exactly when you should ride and for how long. "I’ve been working with Devlin over at Coach Parry for over 3 years, and have seen remarkable improvements in my fitness and strength levels. We started before my first Sani2c in 2016, having hardly ridden a MTB, finishing in A Batch and 22nd overall in 2018. During this time I’ve lost over 10kg, and become overall a much fitter and stronger cyclist. Dev’s programmes are a great mix of zone training, with cross training thrown in. The easy to follow weekly routine helps me plan my week and so that I stick to the programme. Dev is a fantastic cycling coach, very knowledgeable in his field, and an all round great guy." "I've been working with Devlin from Coach Parry since 2015 and I have achieved many goals and just became better and better. Devlin is always there to encourage me and help me whenever needed. Since working with Devlin I've been awarded provincial colours in my age group three years running, national police colours and raced at the SA XCM Champs held in Grabouw, Western Cape in 2018. I've also participated in the following stage races: Sani2C 2016 and 2017, Berg&Bush 2016, Tour of the Legends 2016, Trail&Trout 2018 and the long one day race, namely, Attakwas in 2016 and then again in 2018. Without Devlin, and a proper training programme, I would not have been able to achieve these achievements in such a short period of time." Get help & advice from our coaches and accountability & motivation from the other cyclists in our exclusive online community. No, you are not. You are able to cancel at any time by clicking the cancel button within your membership dashboard or pop us an email and we'll do it for you. We are constantly adding new programmes but right now there are over 50 cycling, triathlon and running training programmes, ranging from beginners programmes 100km/marathon distance. If, once you're on the platform, you feel there isn't a programme for you, simply let us know and we'll write one for you. I am not an elite cyclist, is this for me? Here at CoachParry.com we work with athletes of all abilities and have programmes in the platform that cover all distances and times. If you're just starting out and need a programme that will help you to start out or if you're trying to smash a sub 3 hour Cape Town Cycle tour, this is the platform for you. No, it is not 1 on 1 coaching. If you're looking for a training programme that is 100% customised to your goals, abilities and the time you have available to train then you will be better served to select one of our 1 on 1 coaching options. You can see our 1 on 1 cycling coaching here. What you will get in the Coach Parry Online Training Platform and Community is a wide selection of time goal training programmes that you can follow, a forum where you can ask the coaches questions and a community of athletes ready to support you.